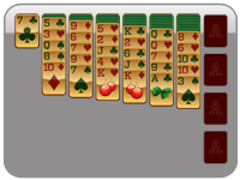 Play Freecell, play Freecell, play Freecell all day! 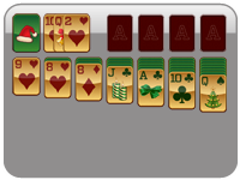 Oh what fun it is to win in this Solitaire card game, hey! 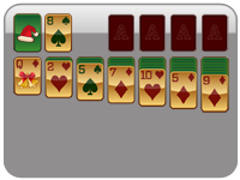 Use the free cells in this game to store cards that are in your way while you move the others around in the tableau. This Solitaire game differs from the others by giving you this option to hold unwanted cards until you can use them again. 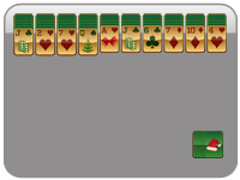 There is a rule to filling these cells though ... the longest run of cards you can move at one time must equal the number of empty free cells plus one. This number is doubled for every open cell in the tableau. 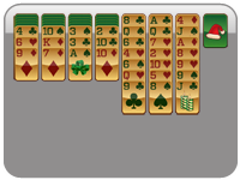 Try to keep as many columns vacant as you can, so you can move more cards around at once. 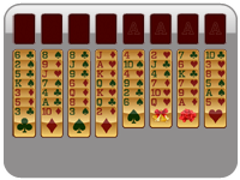 Cards of alternating colors in descending order can occupy the tableau. Foundations should consist of cards from Ace through King in each of the four suits.